The invention relates to a system to provide local mobile geographic information service based on GPS and mobile terminal. The system comprises: a wireless communication network, a GPS position apparatus and mobile terminal, and an internet and path tracking server. The innovation of the invention is adding the following software functional modules in the mobile terminal: a wireless communicationmodule, a GPS receiving module, an interface displaying module, an interest point inquiring module, a path planning module, a positioning module, a path tracking module, a GIS engine module, a database management module and a data layer made up of an interest point database, a geographic data file, a geographic data index file, a geographic data topological file and a initialization configurationfile. The system achieves the advantages of simple, practical, smart in data layer design, convenient in inquiring, low in cost and easy to implement. For storing geographic space data and integrating many software functional modules in the mobile terminal, the system in the invention enable the user to enjoy localized real time geographic space position service conveniently at any moment with less dependence on the server. 本发明涉及一种提供地理信息服务的通信系统，确切地说，涉及一种利用GPS和移动终端的提供本地移动地理位置信息服务（LBS，Location BasedService)的系统，使用该系统，可以选择查阅、显示本地地图并对该地图进行缩放处理，以及实现定位、查询兴趣点、导航和路径跟踪等功能，属于电信增值业务和计算机应用技术领域。  The present invention relates to a communication system for providing geographic information and services and, more particularly, relates to a system using a GPS and a mobile terminal provides a local mobile location information services (LBS, Location BasedService), the use of the system, select View to display the local map and the map zoom processing, and location-based, inquiry points of interest, navigation and path tracking and other functions, is the field of computer technology, telecommunications value-added services and applications. 随着知识经济时代的来临，信息已经成为人类社会财富的源泉。  With the advent of the knowledge economy era, information has become a source of social wealth of mankind. 现在，人们在生产和生活中百分之八十以上的信息都与地理空间位置有关。 Now, it is more than 80 percent of all information related to the geospatial position in the production and life. 信息科学技术的飞速发展与广泛应用带动了全社会对地理位置信息的需求，作为获取、分析处理和管理地理空间数据的重要工具、技术和学科的地理信息系统（GIS，Geographic Information System)，在近十余年来，得到了广泛关注和迅猛发展，并在涉及资源调查、环境评估、灾害预测、国土管理、城市规划、邮电通讯、交通运输、军事公安、水利电力、公共设施管理、农林牧业、统计、商业金融等几乎所有领域都得到了广泛应用，已经成为国家或全球信息流中的重要组成部分，并逐渐发展成为当今社会最基本的信息服务之一。 The rapid development of information science and technology and is widely used to drive the whole society demand for geographic information, as acquisition, analysis and management of geospatial data of important tools, techniques and disciplines of geographic information systems (GIS, Geographic Information System), in Over the past decade, has been widespread concern and rapid development, and resources involved in the investigation, environmental assessment, disaster prediction, land management, urban planning, telecommunications, transportation, military, public security, water power, public facilities management, agriculture, forestry, animal husbandry almost all areas of industry, statistical, financial and other business have been widely used, has become an important part of national or global information flow, and gradually developed into one of the most basic information services in today's society. 众所周知，GIS是一个基于数据库管理系统（DBMS)的管理地理空间对象的信息系统，以庞大的地理空间数据为操作对象是地理信息系统与其它信息系统的根本区别。  As we all know, GIS is an information system database management system (DBMS) in the management of geospatial object-based, to a large geospatial data for the operation object is the fundamental difference between GIS and other information systems. 因此， 海量的地理空间数据既是GIS的重要内容，也是GIS系统的灵魂和生命。 Therefore, the soul and life an important part of the mass of both GIS geospatial data, as well as GIS system. 如何组织和处理这些海量数据是GIS应用系统建设中的关键环节。 How to organize and process the vast amounts of data is the key GIS application system construction. 也是因为要对海量数据进行存储和处理，所以，目前的基于地理位置信息服务的应用主要是以桌面GIS系统的形式出现，如百度地图、Google Map，搜狗地图等。 But also because of the huge amounts of data to be stored and processed, so that the current location based on the application of information services mainly in the form of desktop GIS systems appear, such as Baidu map, Google Map, Sogou maps. 但是，由于桌面GIS的移动性差，不能满足用户日益增长的空间位置信息服务的需求。 However, due to mobility desktop GIS poor, it can not meet the growing needs of the user spatial location information services. 因此，新一代地理信息系统技术_移动式GIS技术就应运而生。 Therefore, a new generation of GIS technology _ Mobile GIS technology came into being. 作为嵌入式GIS的最新发展形式_移动GIS是移动通信技术与传统的空间信息技术相结合的产物，前者为移动空间信息服务提供良好的承载、运营平台，后者能为广大移动用户提供丰富的基于地理位置的空间信息服务。  As the latest form of the development of embedded GIS _ Mobile GIS is a mobile communications technology and traditional spatial information technology product of the combination, the former provides a good bearer for mobile spatial information services, operating platform, which for the majority of mobile users It provides a wealth of information based on the spatial location of service. 然而，尽管移动终端在软硬件上都有了很大改进和提高，但是移动终端的自身设备局限：其在内存、存储器、处理器等方面仍然远不及台式电脑，这就使得许多适用于桌面系统中的技术与方法难以满足嵌入式设备运用GIS 的要求。 However, although the mobile terminal hardware and software has been greatly improved and enhanced, but the limitations of the mobile terminal device itself: it is still far less than desktop computers in terms of memory, memory, processors, etc., which makes many for desktop systems the techniques and methods can not meet the requirements of embedded devices, use of GIS. 因此，目前大多数的移动GIS仍然采用瘦客户端模式，即其大部分GIS功能仍然由服务器中的桌面GIS系统来完成；其主要结构形式是将空间数据存储在服务器端，客户端根据用户请求通过HTTP网络协议与服务器端进行通信，以完成所需的功能。 Thus, most current mobile GIS still thin client model, i.e. most of its functions are still done by the GIS server desktop GIS system; its main structure is the user space request according to the data stored in the server, the client via HTTP protocol to communicate with a network server, to perform the desired function. 有鉴于此，本发明的目的是提供一种能够解决现有技术的上述缺陷、基于GPS和移动终端的提供本地移动地理信息服务的系统，该系统能够将GIS的大部分服务都在本地、即移动终端上实现，几乎没有或者明显减少该移动终端与服务器的交互，以弥补当前桌面GIS系统移动性差和瘦客户端模式实时性差，从而无法提供随时随地的地理空间位置信息服务的不足。  In view of this, an object of the present invention is capable of solving the above drawbacks of the prior art, based on GPS and mobile service providing local mobile terminal geographic information system which is capable of most of the services are GIS lack of local, namely mobile terminal to achieve little or significantly reduce the interaction with the mobile terminal and the server, desktop GIS systems to compensate for the current poor mobility and poor real-time thin-client mode, which can not provide anywhere, anytime geospatial location information services . 无线通信模块，负责完成作为客户端的移动终端与路径跟踪服务器或其他服务器之间的通信功能，通信方式包括短信和超文本传输协议HTTP。  The wireless communication module, a mobile terminal responsible for completing the path tracking client communication function between the server or other servers, the communication system including SMS and Hypertext Transfer Protocol HTTP. 本发明是一种基于GPS和移动终端的提供本地移动地理信息服务的系统，该系统是在现有的网络系统和网元的条件下，针对移动终端开发出来的一个性能优异、功能完善的移动GIS系统，采用本发明系统，由于在移动终端中存储了海量的地理空间数据和集成了许多能够提供地理空间位置服务的软件功能模块，使得用户能在大大减少对服务器的依赖的前提下，随时、便利地享受本地化的、实时的地理空间位置服务。  The present invention is based on GPS and mobile service providing local mobile terminal geographic information system, which is under the conditions existing network systems and network elements, an excellent developed for a mobile terminal performance, functionality complete mobile GIS system, using the system of the invention, since the storage of vast amounts of geospatial data and incorporates many possible to provide geospatial location services software function module in the mobile terminal, so that the user can in greatly reducing reliance on server premise at any time convenient to enjoy localized, real-time geospatial location service. 需要说明的是，本发明的本地化是指立足于移动终端自身设备的“本地”，并不是地理概念上的本地_即终端所在的城市。 It should be noted that the localization of the present invention refers to local _ the city that is located on the terminal based on the mobile terminal device itself "local" is not a geographical concept. 相对于现有的桌面GIS系统和瘦客户端模式，本发明系统的优点是：结构组成简单、实用，数据层的设计巧妙、查询方便，成本低廉，实现容易；只需对移动终端配设相应的软件功能模块和数据层，就能够实现本地化的移动地理位置信息服务。  with respect to the conventional thin-client mode and desktop GIS systems, the advantages of the present invention is a system: structures simple, practical, ingenious design data layer, easy access, low cost, easy to implement; only to the mobile terminal provided the corresponding software function module and the data layer, it is possible to localize a mobile location information service. 而且，本发明系统具有以下特点：（1)移动性强，可以随时随地向用户提供基于地理位置的信息服务。 Furthermore, the system of the present invention has the following characteristics: (1) highly mobile, may provide location-based information services to users anywhere. （2)通信量小，费用低：由于大部分功能都是在移动终端上实现，即所谓服务的本地化，与服务器的通信交互少，有效降低了移动终端与服务器端的通信量，也使得用户的通信费用显著降低， 从而能够吸引和拓展更多的用户群。 Small (2) traffic, low cost: because most of the functions are implemented on the mobile terminal, i.e. less localized so-called interactive communication and services, the server effectively reduces the amount of mobile communication terminal and the server, so that the user can communication costs significantly reduced, which can expand and attract more users. （3)实时性高，由于许多业务都在本地化实现，不仅无须担心因通信链路的通信质量差而导致服务中断或无法使用服务，而且更明显的优点是查询相关信息的时间大大加快。 (3) real-time high, as many businesses are localized to achieve, not only without fear because of poor communication quality of the communication link and cause service interruptions or inability to use the service, but also a more obvious advantage is the relevant information much faster time. （4)灵活性强，用户只需根据自身的需求，在数据层中下载存储不同地点的地理空间位置信息或地图，就能检索和显示相关区域而提供当地的位置信息服务。 (4) flexibility, users simply according to their needs, in the data storage layer download geospatial location information or map different locations will be able to retrieve and display relevant local area and provide location information services. 因此，本发明特别适用于下述用户群：经常在户外工作而又具有空间位置信息服务需求的用户；经常去外地出差或旅游的用户；需要进行路径跟踪的企业，如物流运输，公安系统等。  Accordingly, the present invention is particularly applicable to the following user groups: in outdoor work but often with spatial location information service user needs; users often go business trip or travel; required path tracking business, such as logistics and transport, public security systems. 图1是本发明基于GPS和移动终端提供本地移动地理信息服务的系统中的移动终端软件功能模块和数据层的结构组成示意图。  FIG. 1 is a local mobile of the present invention to provide geographic information service based on GPS and a mobile terminal in a mobile terminal system software function module and a data layer structure composed of FIG. 图2是本发明移动终端中的地理数据文件格式示意图。  FIG. 2 is a schematic view of the geographical data file format in the mobile terminal of the present invention. 图3是本发明移动终端的地理数据索引文件中第二级索引文件结构图。  FIG. 3 is a geographic data index file according to the present invention, a mobile terminal in a second level index file structure of FIG. 图4是本发明移动终端的地理数据索引文件中第一级索引文件结构图。  FIG. 4 is a geographic data index file of the mobile terminal according to the present invention is the first level index file structure of FIG. 图5是本发明移动终端检索、查询地理空间数据的操作流程示意图。  FIG. 5 is a mobile terminal of the present invention, retrieval, manipulation, a schematic flow chart of query geospatial data. 为使本发明的目的、技术方案和优点更加清楚，下面结合附图对本发明作进一步的详细描述。  To make the objectives, technical solutions, and advantages of the invention more apparent, the accompanying drawings The present invention will be further described in detail with. 无线通信模块，负责完成作为客户端的移动终端与路径跟踪服务器或其他服务器之间的通信功能，通信方式包括短信SMS和超文本传输协议HTTP。  The wireless communication module, a mobile terminal responsible for completing the path tracking client communication function between the server or other servers, the communication system comprises a SMS message and a hypertext transfer protocol HTTP. 众所周知，从应用的角度，地理信息系统GIS的组成主要包括硬件、软件、方法和数据等部分；其中计算机的各种硬件和软件为地理信息系统的建设和运行提供工作环境； 方法为GIS的运行和管理提供具体解决方案，采用哪一种方法会直接影响系统性能，影响系统的可用性和可维护性；数据则是GIS的重要内容，也是GIS系统的灵魂和生命。  As we all know, from the application point of view, the composition of geographic information systems GIS mainly includes part of the hardware, software, and other methods and data; wherein the computer hardware and software to provide a variety of working conditions for the construction and operation of geographic information systems; method GIS operation and management of specific solutions, using a method which will directly affect the availability and maintainability of the system performance, affecting the system; the data is an important part of GIS, GIS is the soul and life of the system. 数据的组织和处理是GIS应用系统建设中的关键环节，涉及许多问题。 Organization and processing of data is the key GIS application system construction, involving many issues. 例如：选择何种（或哪些） 比例尺的数据，这些数据的精度能否满足要求，其格式能否被相关软件集成或采纳，采用何种方法对数据进行快速查询和处理，采用何种方法对数据进行更新和维护，等等。 For example: Select which (or which) the scale of the data, the accuracy of these data, can meet the requirements, the format can be adopted or integrated software, The method used for data processing and fast queries, The method used for data is updated and maintained, and so on. 参见图2，先介绍地理数据文件的结构：本发明系统中的地理原始空间数据是由第三方厂商提供的。  Referring to Figure 2, the first section describes the structure of geographic data file: the original spatial geographic data system of the present invention is provided by a third-party vendors. 它是在原始数据的基础上提取出来所需的相关数据后，按照设定的格式存储在自定义的文件中。 After it is required to extract the relevant data based on the raw data, it is set in accordance with the storage format in the file in a custom. 该自定义文件的后缀名为.map。 The custom file suffix named .map. 8据都采用下述三个字段顺序存储：图元的属性字段、图元坐标字段和图元绘制字段；其中， 图元的属性字段是定长的，包括三部分：图元类型、图元名称和组成图元的坐标点个数。 8, according to the following three fields are used sequentially stored: primitive attribute field, and the primitive field element coordinates plotted field; wherein the primitive attribute field is a fixed length, comprising three parts: entity type, entity the name and the number of coordinate points consisting primitives. 图元坐标字段则包含组成图元的所有经纬度值，该字段不定长，其长度取决于组成图元的坐标点个数。 Element coordinate field contains all of the elements consisting of the latitude and longitude values ​​of the field variable length, the length depending on the composition the number of coordinate points primitive. 图元绘制字段也是不定长，用于标识包括图元的颜色、线型、线宽、填充风格和其他特征。 Drawing primitives variable length field is used to identify the primitives including color, line type, line width, fill style and other features. 再介绍地理数据索引文件：为海量的地理空间数据构建良好的索引，并采用有效的算法实现快速的检索，是目前地理信息系统的研究热点之一。  re-introduced geographic data index file: build massive geospatial data is a good index, and the use of efficient algorithms for fast retrieval, is one of the hotspots GIS currently. 尤其是在处理器性能相对较低的嵌入式设备中进行GIS应用开发，优秀的索引结构和算法更是实现移动GIS应用的关键。 In particular, GIS application development is carried out at a relatively low processor performance embedded devices, excellent indexing structures and algorithms is the key to the realization of mobile GIS applications. 目前，在桌面系统中比较流行的索引结构有=Quad-Tree索引、R-Tree索引和网格(Grid)索引等。  Currently, the more popular in the desktop system structure index = Quad-Tree indexes, R-Tree index and the grid (the Grid) indexes. 经过试验和研究，前两种索引结构不适用于嵌入式移动终端。 After testing and research, it is not available for the first two index structures embedded mobile terminal. 因此，本发明系统采用基于网格的二级索引结构。 Accordingly, the present invention system is based on two indexing structured grid. 又因为传统的网格索引结构存在着两大缺陷：（1)不适用于存储字节长度不确定的地理空间数据；（2)对网格内部的地理空间对象的边界进行过多的比较会大大降低地理数据的查询效率。 And because the presence of the conventional index structure with two lattice defects: (1) does not apply to indefinite length byte storing geospatial data; (2) the boundary of the geospatial objects inside the grid will compare undue greatly reduce the query efficiency geographic data. 为此，该系统采用二级索引结构来解决第一个缺陷所带来的问题，并采用自适应查询方式来弥补第二个缺陷所带来的查询效率低的问题。 For this purpose, the system uses two index structure to solve the problem caused by the first defect, and adaptive way to compensate for the query low defect caused by the second query efficiency. 通过对地理空间数据的实验和分析，本发明系统中的地理数据索引文件采用了兼顾检索效率和精度的100X100的网格划分策略：横向100块，纵向100块，形成10000条网格块记录。  The experiments and analysis of geospatial data, geographic data file indexing system of the present invention employs mesh strategy of both retrieval accuracy and efficiency of 100X100: lateral 100 longitudinal 100, forming a grid 10000 blocks are recorded. 这样划分的结果是将整个地图（包括各省、区、直辖市的辖内所有区域的地图、 每个大、中、小城市的城市地图、或全国地图）在逻辑上划分成了10000个地图块，每个网格块对应一个地图块，以便能够通过每个网格块可以查询到对应的地图块的数据。 This division is the result of the entire map (including a map of the area within its jurisdiction all provinces, autonomous regions, municipalities, each large, medium and small cities city maps, or maps of the country) being divided into separate 10,000 map tiles logically, each grid block corresponds to a block, so may be able to query the data corresponding to the tile through each grid block. 所有的网格块的索引项都存放在第二级索引文件中。 All the index entries grid blocks are stored in the index file in the second stage. 参见图3，介绍第二级索引文件的结构：由采用上述方式划分并顺序存储的10000 个网格块记录组成第二级索引文件，而每个网格块记录又是以图层为单位依次排列。  Referring to Figure 3, describes the structure of the index file of the second stage: the above-described embodiment is divided and stored in the order record 10000 grid blocks constituting the second level index files, and each grid block based recording layer and sequentially arranged as a unit. 在每个图层里存储相应的各个地理空间对象的三种数据：即图元标识ID、其最小外包矩阵MBR 和索引值Index，在每个图层记录的最前面是该图层索引记录中的地理空间对象索引的个数，即图元个数。 In each layer is stored in each of the three data corresponding geospatial objects: FIG i.e. element identifier ID, which MBR and minimum outer matrix index Index, the top of each layer is recorded in the recording layer index number of geospatial object indices, i.e., the number of element of FIG. 根据二级网格索引的定义，在第二级索引文件中，每个网格块记录中的地理空间对象，即图元的索引记录的个数是不相同的。  According to the definition of two grid index, the index file in the second stage, each grid block geospatial target record, i.e., the number of primitive index record is not the same. 这样，对于采用文件的存储结构，就难以进行有效、快速的索引值查询。 Thus, for the use of file storage structure, it is difficult to carry out effective and efficient index value queries. 为了解决这个问题，地理数据索引文件又建立第一级索引，以便对第二级索引文件进行快速、有效的索引。 To solve this problem, geographic data and index files to establish a first-level index for fast, efficient indexing of the second level index files. 参见图4，介绍第一级索引文件的结构组成：它是一个以行序为主序的二维数组A 架构的文件，其中第一维共10000项，与第二级索引文件中的10000个网格块记录相对应，第二维共10项，与10个图层相对应，道路相交点Node层不作存储和显示； 每个数组项A[p] [q]的值表示第一级索引文件中第ρ个网格块记录中的第q个图层的索引值：即存储相关数据的首地址。  Referring to Figure 4, the first level index file describes the structure of the composition: it is in a line-sequential two-dimensional array-based sequence A schema file  , wherein the first dimension co-10000, and 10000 grid blocks recorded in the index file of the second stage corresponding to a second dimension of 10 items, with corresponding layers 10, a road intersection point Node layer is not stored and displayed; and each array entry a [p] [ q] represents the value of grid blocks ρ first level index file recorded in the q-th layer of index values: i.e., the first address storage related data. 参见图5，介绍本发明系统查询地理空间数据的全部过程：先根据所要查询的网格块的块号P及其所在的图层号q在第一级索引文件中进行搜索，获得该网格块P对应d 的图层q记录在第二级索引文件中的索引值，即计算下述公式Loc (p，q) =q+pXxXL，式中，自然数P、q分别表示网格块的序号和图层的序号，X为该地图文件的图层总层数，L为索引值所占存储空间的大小；再以计算得到的索引值，即A[p] [q]数值为首地址，在第二级索引文件中查询得到所需的P地图块中q图层的位置，然后在该图层记录中对各个图元标识依次进行比较，查询到所需图元的索引值后，最后以该图元的索引值为首地址在地理数据文件中检索到该图元的各种相关数值，以便在移动终端上提供各种移动地理信息服务。  Referring to Figure 5, the present invention describes a system query geospatial data entire process: first search in the first level index file according to the number of layers q P block number of grid blocks to be located and queried to obtain an index value corresponding to the grid block P q d to the recording layer in the second stage in the index file, i.e., calculated by the following equation Loc (p, q) = q + pXxXL, wherein, P a natural number, q represents each grid sequence number and the block number of layers, the layer total number of layers for the map file X, L is the size of the storage space occupied by an index value; the index value to calculate again obtained, i.e., a [p] [q] NUMERICAL led after the address, in the second stage query index file to obtain the desired position P q tile layer, and identification of individual elements sequentially compares the recording layer, the query to the index value of the required elements , and finally led to the index value of the primitive address file to retrieve geographic data related to the various values ​​of the primitive, to provide various mobile geographic information service on the mobile terminal. 例如：查询网格块3000中图层0的所有图元的空间数据，则根据公式Loc(3000，0)= 0+3000X10XL(L为索引值所占空间的大小)计算得到A 的数值，再根据该索引数值在第二级文件中查询到索引块3000中图层0的位置，然后在该图层记录中依次比较， 最终查询到所要查询的所有图元的索引值。 For example: Query 3000 grid block layers in all elements of the spatial data 0, is obtained according to the formula A Loc (3000,0) = 0 + 3000X10XL (size L of the space occupied by the index value) is calculated  [ 0] value, and then query the index value based on the file in the second stage to the position of the index block 3000 in layer 0, and then sequentially compares the recording layer, the index values ​​of all elements of the final query to be queried . 这样就可以以这些图元的索引值为首地址在地理数据文件中检索到所有图元的各种相关数值，以便在移动终端上提供各种移动地理信息服务。 This address can be led to retrieve all elements in the various geographic data file index value to the correlation value of those elements, to provide various mobile geographic information service on the mobile terminal. 需要说明的是，本发明系统中的上述两级网格索引文件虽然在逻辑上互相独立， 但实际上是存储于同一个文件（地理数据索引文件）中：第一级索引文件的索引数据存放在前面，第二级索引文件的索引数据存放在第一级索引文件的后面，以便减少系统中的文件数量，便以管理，并减少输入/输出操作，提高检索的速度。  Incidentally, the above-described two grid index file system of the present invention, although logically independent of each other, but is actually stored in the same file (index geographic data file): the first level index file index data stored in the front, the index data of the second stage of the index file stored in the index file behind the first stage to reduce the number of file system, to manage it, and to reduce input / output operations, to improve the speed of retrieval. 此外，本发明系统在检索地理空间数据时，根据地图比例尺的变化对查询方式进行采用自适应调整：在比例尺较大时（即地图放大后），在移动终端屏幕中显示的、与查询区域相交的地图块数目较少，此时，将所有与查询区域相交的地图块的数据都视为完全落入查询区域范围以内，并将这些地图块的数据全部读入内存，不再对地理空间对象的边界进行比较，以便判断这些边界是否与查询区域相交。  Further, the system of the present invention when retrieving geospatial data, query adaptive manner to adjust the map scale change: at larger scale (i.e., after map enlarged), the display screen in a mobile terminal, and the fewer number of tiles intersecting the query area, this time, with all the query area intersects the tile data is regarded as fairly fall within the scope of the query area, and all the data is read into the memory block, no longer border geospatial objects are compared in order to determine whether these boundaries intersect the query region. 而当比例尺较小时（即地图缩小后）， 此时在移动终端屏幕中显示的、与查询区域相交的地图块数目较多时，对于没有完全落入查询区域的地图块中的地理空间对象进行边界比较，而对于完全落入查询区域的地图块则不进行比较而直接查询。 When the scale is small (i.e., the zoomed), is displayed in a mobile terminal screen, while the larger the number of tiles and intersects the query area, not completely fall to the query area of ​​the tile boundary of the geospatial objects comparison, the query area for fairly fall map tile is not directly compare the query. 这种根据地图比例尺的变化而自适应的调整查询方式称为自适应查询。 This adaptively adjusted according to the map scale changes is called adaptive query query. 从而有效减少图元边界的比较次数，提高数据查询的效率。 Thus effectively reducing the number of comparisons boundary elements, improve the efficiency of data queries. 数据层中的地理数据拓扑文件是采用传统的十字链表结构存储、记录整个地图的网络拓扑结构的数据文件。  Topology geographic data file in the data layer is cross-linked list structure traditional store, record data file of the entire network topology map. 初始化配置文件用于存储、记录该系统的移动终端启动后，显示地图及其相关操作过程的一些配置参数：包括屏幕的左下角和右上角相对于所显示地图的逻辑坐标、所显示地图的比例尺数组、与屏幕左下角和右上角重叠的所显示地图块的块号、该两个地图块的最小经纬度值、图元文本的显示级别等。  file for storing initial configuration, the mobile terminal records the start of the system, the map display configuration parameters and their associated operating procedure: The corners of the screen includes with respect to logical coordinates of the map display, the display scale of the map array, block number and the top right corner of the screen and overlap the bottom left of the displayed map tile, the minimum of the two values ​​of the latitude and longitude of the tile, and other display level primitive text. 需要说明的是，移动终端为上述各种软件功能模块提供的运行平台是下述操作系统中的任何一种：基于嵌入式操作系统Symbian的Series 60系统、WinCE手机操作系统、 Linux手机操作系统、TD-SCDMA手机系统或其他更高规格的配置，以供用户能随时享受本地化的移动地理位置信息服务。  Incidentally, the mobile terminal functions as the above-described various software modules running platform is provided any one of the following operating systems: Series 60 system based on an embedded operating system Symbian, WinCE mobile operating system, Linux phone operating system, TD-SCDMA mobile phone or other higher specification system configuration for the user to be able to enjoy at any time localization of mobile location information services. 本发明系统中的移动终端基于上述的各个功能模块和数据层文件之间进行交互， 能够很好地为用户提供本地化的地理空间位置服务。  The mobile terminal system according to the present invention, to interact between the various functional modules and data files based layer, to provide users with well localized geospatial location service. 本发明系统已经采用CPU及其周边电路结构比较先进的智能手机设备进行了实施试验，根据上述功能模块组装成功的样机进行了整机系统的性能试验，实验的结果是比较理想的，实现了发明目的，证明本发明系统的架构是可以正常运行和实施的，能够取得预计的发明效果。 System of the invention  The present CPU and peripheral circuits have been employed structure is advanced smartphone device tests the embodiment, the whole system performance test of the functional module assembly according to the successful prototype, the experimental results is ideal, to achieve the purpose of the invention, the present invention demonstrates architecture of the system is running and can be implemented, is expected to be able to achieve the effect of the invention. 1. 一种基于GPS和移动终端的提供本地移动地理信息服务的系统，包括无线通信网、GPS定位装置和移动终端，以及因特网和路径跟踪服务器；所述移动终端包括具有Symbian, Windows Mobile、Linux或其它操作系统的智能手机、手持式个人电脑、个人数字助理PDA或具有图文输入、处理和显示功能的移动通信终端；其特征在于，所述移动终端设有下述软件功能模块：无线通信模块、GPS接收模块、界面显示模块、兴趣点查询模块、路径规划模块、定位模块、路径跟踪模块、GIS引擎模块、数据库管理模块、以及由兴趣点数据库、 地理数据文件、地理数据索引文件、地理数据拓扑文件和初始化配置文件组成的数据层；其中：GIS引擎模块，是该移动终端作为客户端的控制中心，也是该移动终端操作和查询地理空间数据的接口，用于提供包括地图平移、缩放、坐标转换、 1. Based on GPS and mobile service providing local mobile terminal geographic information system, comprising a wireless communication network, and the mobile terminal GPS positioning means, and path tracking server and the Internet; the mobile terminal comprises a Symbian, Windows Mobile, Linux or other operating system for smart phones, hand-held personal computer, a personal digital assistant (PDA) or a mobile communication terminal having a graphic input, processing and display functions; wherein said mobile terminal is provided with the following software modules: a wireless communication module, GPS receiver module, interface display module, a point of interest query module, path planning module, positioning module, path tracking module, GIS engine module, database management module, and the points of interest database, geographic data file, geographic data index file, geography data topology file and initialize profile data layer thereof; wherein: GIS engine module, that the mobile terminal as a control center client, but also the mobile terminal operations and queries geospatial data interface for providing a map pan, zoom, coordinate conversion, 问数据层中各个地理数据文件的多种功能；数据库管理模块，负责访问和管理兴趣点数据库，完成兴趣点查询模块设置的各种查询、检索功能；定位模块，负责完成GPS定位的相关功能：包括对GPS数据的解析、调用GIS引擎模块进行坐标转换、以及调用界面显示模块在地图上显示当前的定位位置；路径跟踪模块，用于将由GPS接收模块获得的地理位置信息打包后通过无线通信模块定时发送给路径跟踪服务器，使得该路径跟踪服务器能够根据其获得的位置信息对移动终端进行监测和路径跟踪；路径规划模块，负责进行路径分析和搜索计算，以便根据用户输入的出发地和目的地， 快速地完成最优路径的计算，并将该最优路径显示在地图上；兴趣点查询模块，负责根据设定的兴趣点名字或设定地点周围完成查询兴趣点信息的功能，且在进行周围查询过程中， Asked a variety of functions of the various geographic data file of the data layer; database management module is responsible for accessing and managing the various points of interest database, the completion point of interest query module set query, retrieval functions; positioning module, responsible for the completion of the related functions of GPS positioning: GPS data includes parsing, GIS engine module calls the coordinate conversion, and invoking interface display module displays the current location on the map is positioned; the location information of the path tracking means for the module obtained by the GPS receiver via the wireless communication module package regularly sent to the tracking server path, so that the server can track the path of the mobile terminal to monitor and track the path of the position information which is obtained; route planning module, responsible for the calculation and the search path analysis, according to the origin and destination input by the user completed quickly calculate the optimal path, and the optimal path is displayed on the map; the point of interest query module, responsible for completion of the inquiry points of interest information according to points of interest around the set name or set location, and making around the query process, 能进行专项主题的查询；在查询到具体兴趣点后，再调用路径规划模块来确定前往该兴趣点的最优路径；界面显示模块，作为该移动终端的人机交互界面，接收来自用户的各种操作，并显示响应结果；另一功能是完成地图的各种绘制和显示功能；GPS接收模块，负责该移动终端与外置的GPS定位装置之间的蓝牙通信，以获取并解析GPS数据；无线通信模块，负责完成作为客户端的移动终端与路径跟踪服务器或其他服务器之间的通信功能，通信方式包括短信和超文本传输协议HTTP。 Can be queried special theme; after querying specific points of interest, then call path planning module to determine the optimal path go to the point of interest; interface display module as a man-machine interface of the mobile terminal, each receives from the user modes of operation, and displays the response result; another function is to map various rendering and display functions; GPS receiver module, is responsible for the Bluetooth communication between the mobile terminal and the external GPS positioning means to obtain and parse GPS data; the wireless communication module, a mobile terminal responsible for completing the path tracking client communication function between the server or other servers, the communication system including SMS and hypertext transfer protocol HTTP. 2.根据权利要求1所述的系统，其特征在于：所述地理数据文件是从现有的原始地理空间数据中提取出来相关数据后，再按设定格式存储在自定义的数据文件中，其结构如下： 开始的两个字段是该文件中唯一的，分别用于标识文件版本信息的版本字段和防止因地理空间数据遭到破坏而导致系统混乱的文件校验和字段，后面是按照图层序号顺序存储的地理空间数据，每层的所有图元数据则根据图元标识ID的大小依次相邻接地存储，直到将所有图层数据都存储好；各层的地理空间数据都采用下述三个字段顺序存储：图元的属性字段、图元坐标字段和图元绘制字段；其中，图元的属性字段是定长的，包括三部分：图元类型、图元名称和组成图元的坐标点个数；图元坐标字段包含有组成图元的所有经纬度值，该字段不定长，其长度取决于组成图元的坐标点个 2. The system according to claim 1, wherein: the geographic data file is retrieved from the existing raw geospatial data out of the data, then a custom setting storage format data file, the following structure: the two fields is beginning the only file, respectively, the version field identifies the file version information of the file and a checksum field by preventing geospatial data destruction caused by chaotic system, according to FIG followed geospatial data storage layer sequence number, all the meta-data of each layer is sequentially stored in accordance with the size of the ground adjacent to the identification ID of the primitive, all layers until good data is stored; geospatial data layers are used the following sequentially storing three fields: element attribute field, and the primitive field element coordinates plotted field; wherein the attribute field is a fixed length primitive, comprising three parts: entity type, entity name and composition primitives the number of coordinate points; primitive coordinate field contains all of the elements consisting of latitude and longitude values ​​of the field variable length, the length depending on the composition of a primitive coordinate points ；图元绘制字段也是不定长，用于标识包括图元的颜色、线型、线宽、填充风格和其他特征。 ; Drawing primitive field is variable length, including primitives for identifying color, line type, line width, fill style and other features. 3.根据权利要求1所述的系统，其特征在于：所述地理数据索引文件是为在海量的地理空间数据中采用自适应查询方式实现快速检索而构建的二级索引结构的索引文件，它是该系统能够在嵌入式设备实现移动GIS应用的关键；所述地理数据索引文件的二级索引结构如下：第二级索引文件由顺序存储的mXn条网格块记录组成，其中m和η均为大于1的正整数，该mXn条网格块记录是以纵向m块、横向η块的均勻划分方式，将整个地图在逻辑上划分为mXn个地图块而对应形成的，用于通过每个网格块来查询与其相对应的地图块的数据；每个网格块记录是以图层为单位依次排列，在每个图层里存储相应的各个地理空间对象的三种数据：即图元标识ID、其最小外包矩阵MBR和索引值Index，每个图层记录的最前面是该图层索引记录中的地理空间对象索引的个数；第一级索引文件 3. The system of claim 1, wherein: the geographic data and the index file is the index file is constructed in an adaptive query geospatial data quick retrieval of the mass of the secondary index structure, which GIS is the key to mobile applications the system can be implemented in an embedded device; secondary index data structure of the index file is as follows geographic: mXn Article grid block index file stored by the second stage of the recording sequence, where both m and η positive integer greater than 1, the mXn strip grid block is recorded m the longitudinal block, a uniform lateral η block division manner, the entire map is logically divided into a mXn formed to correspond to the tile, for each through grid blocks to query the data corresponding thereto to the tile; each grid block is recorded in units of a layer are arranged sequentially in each layer in each of three data storage corresponding geospatial object: i.e. 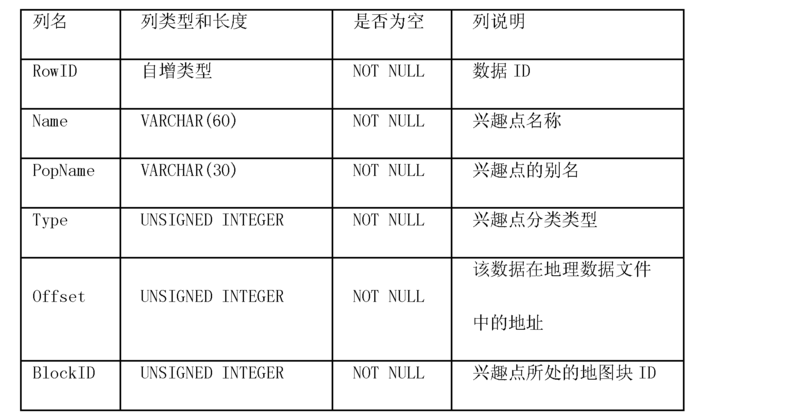 primitives identification ID, which MBR and minimum outer matrix index index, the front layer of each record is the number of the spatial object index geographical index record layer; a first level index file 一个以行序为主序的二维数组A[mXn] [χ]架构的文件，其中m、n和表示该地理数据文件的图层总层数的χ均为大于1的正整数，用于对每一图层的地理空间对象、即图元的索引记录个数不相同的第二级索引文件进行有效、快速的索引值查询；其中第一维共mXn项，与第二级索引文件中的mXn个网格块记录相对应，第二维共χ项，与χ 个图层相对应，道路相交点Node层不作存储和显示；每个数组项A[p] [q]的值表示第一级索引文件中第P个网格块记录中的第q个图层的索引值：即存储相关数据的首地址；式中， 自然数P和q的取值范围分别是[4，mXn]和[2，χ]；上述二级网格索引文件在逻辑上互相独立，但实际是存储于同一个文件中：第一级索引文件的索引数据存放在前面，第二级索引文件的索引数据存放在第一级索引文件的后面，以便减少系统中的文件数量，便以管理 In a line-sequential order based two-dimensional array A [mXn] [χ] schema file, wherein m, n, and represents the total number of layers of layers of the geographic data file [chi] are positive integers greater than 1, for geospatial objects each layer, i.e., the index number of the recording elements of different second level index files efficiently and quickly query index value; wherein a first dimension co mXn items, the index file as in the second stage the mXn grid blocks corresponding record, a total dimension of the second term χ, and χ corresponding to a layer, a road intersection point Node layer is not stored and displayed; and each array entry a [p] [q] represents the value of an index file index of the first grid blocks P q-th recording layers: i.e., the first address storage-related data; wherein, the range of P and q are natural numbers, respectively [4, mXn] and [2, χ]; the above two grid index file are logically independent of each other, but are actually stored in the same file: the first level index file index data is stored in the front, the index data of the index file stored second stage behind the first-level index file in order to reduce the number of files in the system, then the management 并减少输入/输出操作，提高检索速度。 And reducing input / output operations, improved retrieval speed. 4.根据权利要求3所述的系统，其特征在于：所述整个地图是各省、区、直辖市的辖内所有区域的地图、每个大、中、小城市的城市地图、或全国地图。 4. The system of claim 3, wherein: said map is a map of the entire area within its jurisdiction in all provinces, regions, municipalities, each of the large, medium and small urban city map, or a national map. 5.根据权利要求3所述的系统，其特征在于：所述系统在查询地理空间数据时，先根据所要查询的网格块的块号P及其所在的图层号q在第一级索引文件中进行搜索，获得该网格块对应图层记录在第二级索引文件中的索引值，即计算下述公式Loc (p，q)= q+pXxXL，式中，P、q分别表示网格块的序号和图层的序号，x为该地图文件的图层总层数，L为索引值所占存储空间的大小；再以计算得到的索引值，即A[p] [q]数值为首地址，在第二级索引文件中查询得到所需的P地图块中q图层的位置，然后在该图层记录中对各个图元标识依次进行比较，查询到所需图元的索引值后，最后以该图元的索引值为首地址在地理数据文件中检索到该图元的各种相关数值，以便在移动终端本地提供各种移动地理信息服务。 5. The system according to claim 3, wherein: said system when querying geospatial data, in accordance with the layer number of the first block number P q grid blocks to be queried and the location in the first level index search file, the obtained recording layer block corresponding to the mesh index in the index file in the second stage, i.e., calculated by the following equation Loc (p, q) = q + pXxXL, where, P, q respectively represent network cell number and the block number of the layers, x of the total number of layers of the layer map file, L is the size of the storage space occupied by an index value; the index value to calculate again obtained, i.e., a [p] [q] NUMERICAL headed address, a second stage in the index file location query to obtain the desired tile q P layer, and then the individual elements are sequentially compares the identification recording layer, the query to the index value of the required elements after the last address search led to the primitive in various geographic data file to the index value of the correlation value of the primitive, so as to provide a variety of mobile service in a mobile terminal geographic information locally. 6.根据权利要求3所述的系统，其特征在于：所述系统查询地理空间数据时采用的自适应查询方式是根据地图比例尺的变化对查询方式进行自适应调整：在比例尺较大时，即地图放大后，在移动终端屏幕中显示的、与查询区域相交的地图块数目较少，此时，将所有与查询区域相交的地图块的数据都视为完全落入查询区域范围内，并将这些地图块的数据全部读入内存，不再对地理空间对象的边界进行比较，以便判断这些边界是否与查询区域相交；当比例尺较小时，即地图缩小后，在移动终端屏幕中显示的、与查询区域相交的地图块数目较多，此时要对没有完全落入查询区域的地图块中的空间对象进行边界比较，而对于完全落入查询区域的地图块则不进行比较而直接查询；从而有效减少图元边界的比较次数，提高数据查询的效率。 6. The system according to claim 3, wherein: said adaptive system query query used when geospatial data is adaptively adjusted according to the map scale of the query changes: in large scale, i.e., after the enlarged map, the display screen in a mobile terminal, intersects the query area with the smaller number of tiles, at this time, the query area intersecting all of the tile data is considered fully fall within the scope of the query area, and all the data block read into memory, the object is no longer geospatial boundary is compared in order to determine whether these boundary intersects the query area; when the scale is small, i.e., after the zoomed display screen in a mobile terminal, and the number of the block intersects the query area is more, this time to the spatial query object is not entirely fall within the area of ​​the tile boundary in comparison, and for the tiles fairly fall comparing the query area is not directly query; whereby effectively reducing the number of comparisons primitive boundaries, improve the efficiency of data queries. 7.根据权利要求1所述的系统，其特征在于：所述地理数据拓扑文件是采用传统的十字链表结构存储、记录整个地图的网络拓扑结构的数据文件。 7. The system according to claim 1, wherein: the geographic topology data file using the traditional cross-linked list structure stored record data file of the entire network topology map. 8.根据权利要求1所述的系统，其特征在于：所述初始化配置文件中记录有该系统启动、运行后，在屏幕上显示地图及其相关操作过程中的配置参数：包括屏幕的左下角和右上角相对于所显示地图的逻辑坐标、所显示地图的比例尺数组、与屏幕左下角和右上角重叠的所显示地图块的块号、该两个地图块的最小经纬度值、图元文本的显示级别。 8. The system according to claim 1, wherein: the file recorded in the initial configuration of the system to start, run, process and display the configuration parameters related to the operation map on the screen: the screen comprises a lower left corner and the upper right corner with respect to logical coordinates of the displayed map, the scale of the displayed map array, overlapping with the screen the corners of the displayed map tile block number, the minimum value of the latitude and longitude of the two tile, text primitives display level. 9.根据权利要求1所述的系统，其特征在于：所述兴趣点数据库是一个存储每个兴趣点的各种相关信息的数据表格：包括数据标识ID、兴趣点名称、兴趣点别名、兴趣点分类类型、该数据在地理数据文件中的索引值：地址、以及其所在的地图块标识ID。 9. The system according to claim 1, wherein: the point of interest database is a data table storing a variety of information related to each point of interest: including data identifying ID, point of interest name, alias points of interest, interest point classification type, the data in the geographic data file index value of: address, and its identification in map tile ID. 10.根据权利要求1所述的系统，其特征在于：所述移动终端为上述各种软件功能模块提供的运行平台是下述操作系统中的任何一种：基于嵌入式操作系统Symbian的Series 60系统、WinCE手机操作系铳、Linux手机操作系统、TD-SCDMA手机系统或其他更高规格的配置，以供用户能随时享受本地化的移动地理位置信息服务。 10. The system according to claim 1, wherein: said mobile terminal is a function of the above-described various software modules running platform is provided any one of the following operating systems: the embedded operating system Symbian Series 60 system, WinCE mobile operating system blunderbuss, Linux mobile operating system, TD-SCDMA mobile phone or other higher specification system configuration for the user to be able to enjoy at any time localization of mobile location information services.